‘I don’t have to look nice for anyone’ explains a messy haired girl of 13, seated in a high school auditorium. Her name is Harper Willat and, along with her sister Amber, she was the subject of ‘Dirty Girls‘, a documentary filmed in 1996 that has been gaining a lot of attention over the past few months on the internet. 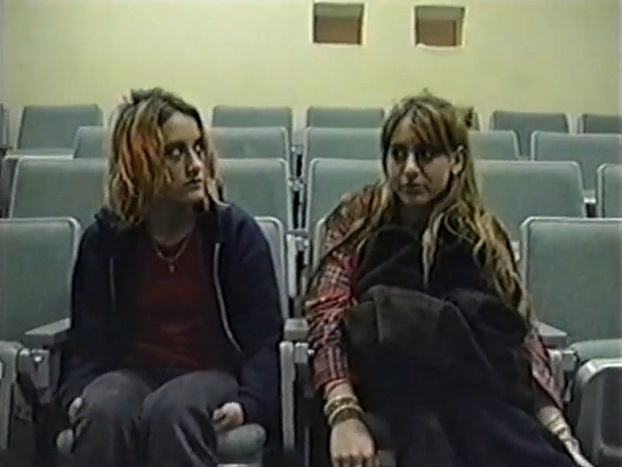 Harper and Amber, along with their friends, are labelled ‘Dirty Girls’ by their high school peers who claim Harper hasn’t shower since the death of Kurt Cobain. Their appearance is very different to the clean cut kids who surround them: hoodies, dorky t-shirts and big fur coats are worn with an air of self-assurance that you can’t help but be impressed by. The girls are by no means traditionally ‘cool’, one girl explains that her t-shirts was a gift from her cleaner, another received her top from her psychologist. But it is these eccentricities and this openness that makes the Dirty Girls so wonderful. But remarkably, in the eyes of the rest of the school Amber and Harper weren’t self-assured forward thinkers: their behaviour, ideals and clothing were all seen as an act of misguided rebellion. That seems to be the message that most people took away from the film: the Dirty Girls were remarkably self-assured girls, and their attitude toward getting dressed was spot on. Amber said the girls were ‘just dressing how we want to dress, and it has nothing to do with fitting a movement, fitting a new style’ and to me this was an idea that held a very strong appeal; it really stuck. I began to think of what I would wear if I disregarded style and forgot about my peer’s approval – a leopard print snuggie crossed my mind a quite few times, I’ll admit. I always thought that I dressed for myself the overwhelming majority of the time, but Harper and Amber’s just-don’t-care attitude really made me wonder how much emphasis I was putting on outside approval without even realising it. I asked myself: what would I wear if I really didn’t care? In fact, I took this question as a kind of challenge: I was going to start absolutely whatever I felt like. As far as challenges go, this one was simple: forget what my peers will think, forget trends and let my imagination run wild, truly unhindered by outside expectations. As Amber said, ‘I don’t have to dress for anyone’. I found the results of this little challenge to be pretty damn good. I can tell you first hand that it’s a great feeling to go to a café wearing a silk bathrobe and more gemstones than Gwen Stefani in her No Doubt days. Surprisingly, other people seem to really like this anything-goes attitude to dressing. My friends have all embraced my wackier ensembles, with some even taking up the same challenge by dressing in absolutely whatever they like. I haven’t just gotten compliments out of this approach though; I’ve begun to draw more enjoyment from getting dressed. What was simply an everyday routine has become a much more fun, imaginative exercise since I’ve begun dressing as whoever I feel like. On some days that ends up being a sassy librarian and on other days, a member of a 90’s girl band. That being said, there are still times when I feel like jeans and t-shirt are really the way to go, but I do it knowing it’s exactly what I want to be doing – and I feel so much better for it. We all think about what we’d wear if we could get away with anything but the thing is, we already can. That outfit you thought was too outrageous to get away with? Wear it tomorrow. Be a Dirty Girl. Hey, I haven’t showered since the death of Kurt Cobain either! This entry was posted in Fashion, Film and tagged 1990s, amber, attitudes, clothing, dirty girls, documentary, fashion, film, harper, lip, lipmag, riot grrrl, style. Bookmark the permalink.